Hempstead, New York (CNN) – Give a slight edge to President Barack Obama. Forty-six percent of voters who watched Tuesday night's presidential debate said that the president won the showdown, according to a CNN/ORC International nationwide poll conducted right after Tuesday night's faceoff here at Hofstra University on New York's Long Island. Thirty-nine percent questioned said Republican nominee Mitt Romney did the better job. Obama's seven-point advantage came among a debate audience that was somewhat more Republican than the country as a whole and is within the survey's sampling error. 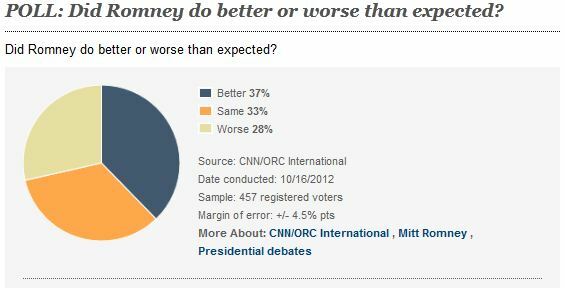 Tuesday night's poll only reflects the view of voters who watched the debate, not the views of all Americans. The reactions of all voters across the country to the second presidential debate must wait until polls are conducted in the coming days. Nearly three quarters of debate watchers felt that Obama performed better than they had expected, with just one in ten saying that the president did worse. Only 37% said that the former Massachusetts governor did a better job in the debate than they had expected, with 28% saying Romney performed worse than they had expected prior to the faceoff, and one in three saying he performed the same as they expected. According to the survey, Obama had a 47%-41% edge on which candidate was more likeable. But on some key issues, Romney came out on top, including an 18-point lead on the economy. "Mitt Romney was seen as better able to handle the economy, taxes, and the budget deficit among the debate audience, but it seems that issues were trumped, or at least blunted, by intangibles, including the expectations game," says CNN Polling Director Keating Holland. By a 49%-35% margin, debate watchers thought that Obama spent more time attacking his opponent. The president was expected to be more forceful in attacking Romney following his lackluster performance in the first presidential debate in Denver two weeks ago. Other questions showed little daylight between the two candidates among debate watchers on some key characteristics. Romney had a 49%-46% edge on which candidate seemed to be the stronger leader and 45%-43% margin on who answered questions more directly, while Obama had a 44%-40% advantage on which man seemed to care more about the audience members who asked questions. Debate watchers were divided on whether Romney offered a clear plan for solving the country's problems, with more than six in ten saying the president didn't offer a clear plan. What will it all mean in November? On that measure, the debate can best be described as a tie. 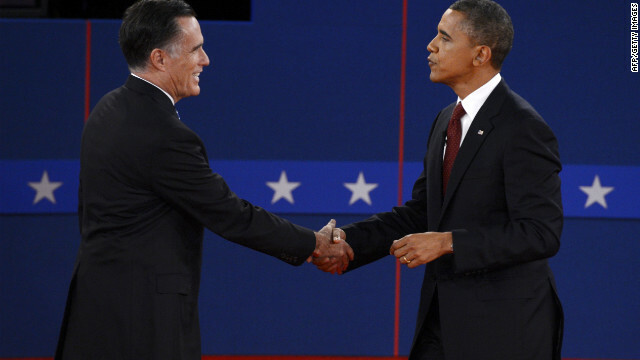 One-quarter of debate-watchers said the event made them more likely to vote for Obama, and an equal amount said it made them more likely to vote for Romney. Half said it would have no effect on their vote. The sample of debate-watchers in this poll was 33% Democratic and 33% Republican. "That indicates that the sample of debate watchers is about eight points more Republican than polls taken among all Americans throughout 2012, so the debate audience was more Republican than the general public," added Holland. "This poll does not and cannot reflect the views of all Americans. It only represents the views of people who watched the debate." The CNN poll was conducted by ORC, with 457 registered voters who watched the debate questioned by telephone after the end of the debate. The survey's sampling error is plus or minus 4.5 percentage points. 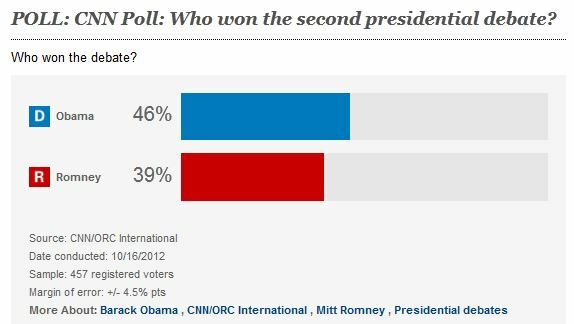 By a 37%-30% margin, a CBS News poll conducted after the second debate also indicated that Obama won the showdown. – CNN Political Editor Paul Steinhauser contributed to this report.